A US Army machine gun company on the way to front, 1918. 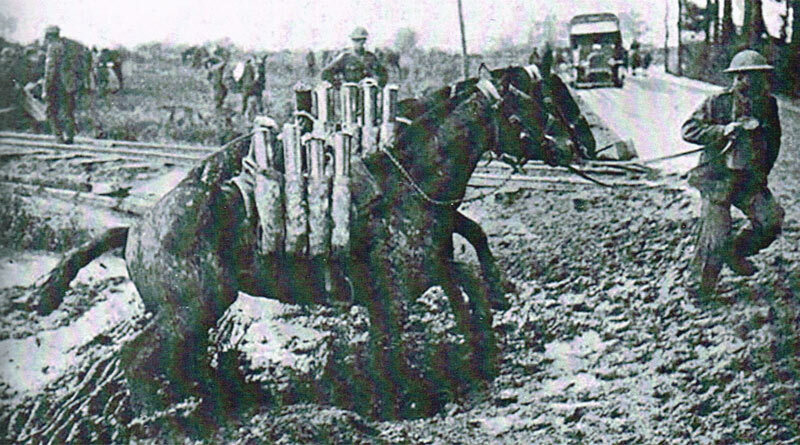 A project that has been “a labor of love” to commemorate equines in World War One has been launched, as part of the WW1 Centennial Commission. Horse Heroes is an extensive and meticulously researched web-based presentation documenting all aspects of the use of American horses and mules in World War I. With more than 75,000 words of text and 250 images and video clips, the site’s content was researched and authored by volunteer Jo Ellen Hayden (B.A.,M.A., History) for Brooke USA. It is suitable as a resource for schools as well as for college-level course material, and presents the largest collection of photographs of American animals in WW1 available on the web. Conceived and designed in collaboration with the US World War One Centennial Commission, the website features accurate historical information on purchase, training, shipping, veterinary care, and battlefield conditions for these animals. Background about the war and its geography, trench warfare, weather in France, social conditions in 1914-1918, and basic information about horses and mules are provided in the “Setting the Scene” section of the website, to enhance understanding of how those conditions impacted equines and the men they served. Extensive information is presented about how the animals were used both as draft animals in harness, and as riding animals under saddle. There are sections on equipment such as harness, saddlery, shoes and vehicles, and how the mobilization for war impacted those industries. A section is devoted to the US Army Veterinary Corps, which was formed only a year before the war began and struggled to provide care under unimaginably desperate conditions. World War One took place between July 1914 and November 1918 and was one of the deadliest conflicts in world history. More than 9 million combatants and 7 million civilians died as a result of the war, as well as millions of horses and mules (there is no exact count, but by most estimates the number was about 8 million). The United States officially entered the war April 6, 1917. Some 4.7 million Americans stepped forward to serve in uniform during the war, 2 million of them were deployed overseas to fight, and 116,516 of them never made it home. During the war, animals were a commodity, and just as armed forces routinely left hardware and vehicles behind rather than pay to transport them back to the US, the horses and mules were disposed of wherever they happened to be at the end of the war. Some were sold to be slaughtered, as human consumption of horse meat was common in some parts of Europe. Others were sold as farm or utility animals to locals. At least 10 million horses and mules were used by all the various countries involved, and of those, at least 1.3 million came from the United States. Only about 200 returned to the US. Brooke USA traces its roots to the work of Dorothy Brooke, who rescued 5000 former war horses and mules who were left in Cairo by the British army after the war. The London-based charity subsequently named in her honor, Brooke, has over the past 84 years become the world’s largest international equine welfare charity, with programs in some of the poorest countries on earth. “When people are aware of the past, the present becomes more meaningful to them,” Hayden said. “The horses that Dorothy Brooke rescued in Egypt in 1931 had brands that identified them as having been owned by the British army. Yet, that army could not protect them from the working conditions imposed by their new owners in Egypt. Those new owners were in large part ignorant of how to care for their animals, and were living very difficult lives themselves. It is no different in the countries where Brooke works today. Picket lines were the most common means to secure animals for the night if no stables were available. Picket lines are ropes strung about 36” off the ground to which animals are tied at intervals. “For Brooke USA, the memory of World War One’s horses and mules inspires our work every day — we have never forgotten, and we are putting that memory to a very practical use by improving the lives of working equines and their human families every day, every year, all over the developing world,” Hayden said. Both Brooke USA and the United States World War I Centennial Commission hope the new site will encourage people to learn more about their country’s history and how they may help equines in similar devastating situations today by supporting Brooke’s work abroad. By continuing to educate owners on sustainable practices, proper nutrition and veterinary care, Brooke improves the lives of millions of animals, benefiting millions of people who depend on them, each year. The U.S. World War I Centennial Commission was established by Congress in 2013 to provide education programs, public outreach, and commemorative events regarding the American involvement in the war. Brooke USA was founded in 2007 as a sister organization to Brooke, the world’s largest equine welfare charity. It is fitting, since it is quite possible that some of the horses Dorothy Brooke rescued in Egypt actually came from the US, as a significant percentage of British army horses were bought in the US. ← Applying a blanket rule: Are you over-rugging your horse? able to. The were transported by boxcars at night to their hidden deaths. These remembrances are critical bc horses miles donkeys and other mammals died after they work securing freedom and safety for humans. Each and every life lost deserves to be honored. Both human and animals suffered horribly to end the war to end all wars. Give it Brooke if you can. Bless the beasts……… The war was cruel to both humans and animals. Hope that history never repeats itself ever again. They do need to always be remembered for their sacrifices.